Peter didn’t just write, ‘knowing the truth’, he wrote, ‘obeying the truth’. The true things Jesus taught us are not just supposed to sound beautiful. It’s always practical with God. Tonight heading out to a meeting I passed a car that slowed to a stop next to me. The driver leaned over and asked me if she could ask me something. She pointed out that a man at the end of the road maybe wasn’t well, and asked if I could just stick around while she checked the situation out. I crossed over and headed towards her reversing car. It turned out a man was walking home with heavy bags in this freezing weather, and was near home but struggling to catch his breath. I offered to help him carry them a few yards to his home, an easy thing to do, and smiled at the driver and she left. He turned out to be a lovely, courteous gentleman who really needs to take things easier. I’m going to invite him to our next lunch. It was lovely to feel that our community can work together and trust each other. If we all show each other sincere love – ‘love that looks like something’, as Heidi Baker says, the world will be a better place. We each experience ‘the world’ one person at a time. Let’s treat each other well this week. There are too many people hating others and fearing what other people can do. Some people have a lot of influence, but the things that you or I can do today may have a tremendous impact on one person, more impact for them than whatever headlines they have been reading . Person to person, sincere love. 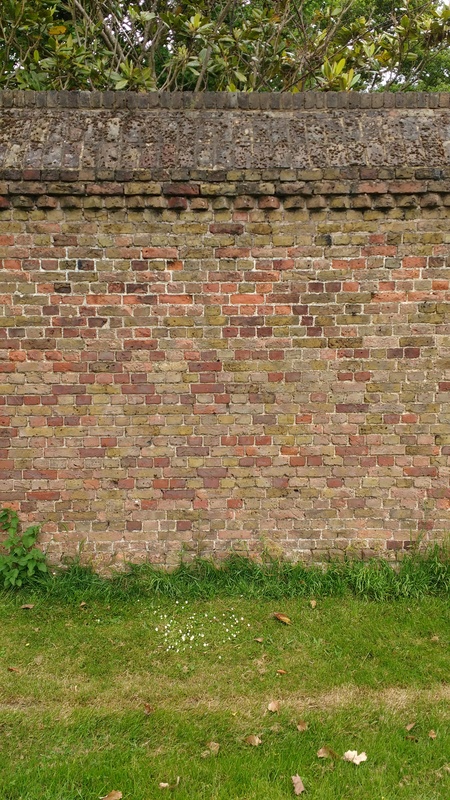 Brick wall at Syon Park, England. “Then people brought little children to Jesus for him to place his hands on them and pray for them. But the disciples rebuked them. Today I met a little girl of about 4 years, who showed me what it was to be full of love and delight, to rejoice, and express herself without fear or restraint. We were at a food fair at Syon Park, and the communal tables allowed people to easily mix. Her mum left her there opposite me while she fetched something, and soon enough I was the happy audience of her stream of consciousness, which stopped every now and then to check whether I knew the little friends she was talking about, or had tried the ice cream yet. As for me, how grateful I was for her today. God knew I needed a lift, and he put her in front of me and reminded me what unalloyed joy looks like; how to relate to others without overcaution. It’s contagious. On Sunday I found myself doing the same with someone, where I would have usually been more circumspect, and I noticed how my readiness to declare myself glad of someone’s company enabled our friendship to move on that little bit further. Jesus wants us sharing and enjoying each other. He’s put us on this earth to be a blessing to one another. It’s hard to share love if you’re in damage limitation mode. To my talkative little friend in Syon park with the black jacket and the pink wellies, never let anyone tell you to talk less, you are a joy. As a sidenote, enfolded in this story of Jesus from Matthew’s gospel is a unique little insight into how Jesus was treated by the general public. Somewhere between a saint and a celebrity, people wanted him to bless their little ones. They wanted their most treasured expression of hope for the future to be blessed by him. We also lay our hands on people when we pray for them. I’m ever grateful that God showed us what it would look like if God himself walked the earth. Sometimes we see such an excellent facet of beauty in another human being that it brings us nearer to understanding what God is like, and shows us how flimsy are the walls that keep us from each other. Even Syon Park’s walls are not as beautiful as the transformative qualities of those who can walk right through them. I heard Larry Randolph recently describe someone being helped through a low patch by memorizing scripture. Ever up for a challenge, I started with Ephesians, having heard it set alight by fantastic teaching from Alfred Pinnington in my church about the links between the Roman adoption process and the images in Ephesians 1, (ref. William Barclay). I love growing in God’s understanding of my identity, because I always seem to access hope and joy that way. Some Bible passages are so full of big concepts and tightly written that it’s easy to gloss over the words, as if they are an indigestible wad of food that’s too rich for me. Memorizing seems to overcome this, and it becomes an act of interacting with someone who has had an extraordinary experience of God, which then enriches my own. As I walked along through sunny streets chewing on these words, I started thinking about how Paul is writing this in prison, and how he chooses to focus on God’s will in making him an apostle. Memorizing forced me to slow down and repeat my reading until I a saw the choices the writer had made, and started fully engaging with his meaning. Since I’ve found it hard to memorize more than the first few verses, I’ve wanted to start at the beginning again and I’ve discovered new angles every few times. It’s really cool. What rich writing! So it occurred to me that Paul’s choice of words implies that he’s still very conscious that God was prepared and willing to choose him as his representative, even though he once persecuted Christians. When God met him on that road to Damascus and challenged him, that in breathing murderous threats against Christians, he was actually persecuting the one who was showing up on that road as God himself. Why do I keep coming back to Paul’s story? Why start with Ephesians, when the gospels hold more direct stories about Jesus? For one thing, I’m encouraged that Paul was discovering Jesus and interacting with him as we do: through prayer, meditation on the word and was intentional about using the testimonies of the disciples who had been privileged to walk with Jesus during his bodily lifetime on the earth. For another, I think I still have a long way to go in really appreciating God’s grace, and leaving behind a desire to earn it. God is so incredibly kind and merciful. Every time I feel like I should be so much further along in my walk with him by now (or some such harsh judgment) he sends me someone to encourage me and remind me that God’s love doesn’t see me in those impatient terms. In such a week, I will find myself having several conversations with friends, or reading passages, or having experiences, that show me that God is a lot less ‘Religious’ and mean than my self-criticism suggests he is. How come I still fear he’s like that after apparently knowing him so long? Perhaps I need to do as Paul does, connect the dots and give thanks for how far he’s brought me, instead of worrying how far I have to go to some imaginary ‘pass’ mark. He’s brought me a long way out of shyness, of looking for approval from others, and so much else. For the record, I didn’t used to kill Christians. But every time I give myself a hard time for not being a better x y z, I am killing a little part of me, a Christian whom God is trying to encourage and teach and help grow, not shrink. Sorry God. There are more interesting things to think about! Paul’s letters always go to thankful praise. What can you thank him for today? Let me also count the ways. Determination works for a while. Gritting one’s teeth and pushing through; making a go of it; as English users we clearly get creative when it comes to describing the act of making an effort despite challenge. Something I’ve been thinking about lately is that there is a difference between doing something with determination and doing something fuelled by excitement and God’s divine energy. Determination isn’t necessarily wrong, but God’s power is a bullet train. In New Testament Greek this is dynamis – the same root gives us dynamic and dynamism. There’s altogether a lot more energy in my actions when they are powered by God. I think back to when I first contemplated joining my first mission trip, which was to Uganda in November 2014, to assist with a SOMA teaching mission requested by a bishop in a beautiful part of SW Uganda. One day I was thinking about the announcement that there would be a mission trip, the next minute in my curiosity I was avidly reading everything I could about the place. From that moment on I was hooked, and agreements that might have been difficult fell into place very quickly. God had set up dominoes and was just waiting for me to push the first one and show an interest. His will was not hard to discern. I just had to jump on board. It had a powerful engine all its own. The challenge in all this, I’m finding, is to discern what is of man and what is of God. Am I excited about a particular ministry because it’s God’s direction for my life, or because the grass seems greener on the other side? Are excited conversations with people about travel, or worship, or a hundred other things, an indication of a new direction in life, or am I idolising people with skills I covet and losing sight of God who is the source of the energy? In church last night there was a powerful sense of the presence of God. As we sang together and fixed our thoughts on who God is, the focus became God, and the sense of his mighty strength and great love was real. In those moments, no fears can grip our hearts. We can sing words that speak of great trust, our hearts full of hope. I want to live like that when the music stops too. After the head-spinning wonder of feeling so in tune with him yesterday, I want to keep singing even when the dreams have to be put into practice, and the challenge of living a day well come into sharp focus. God knows this. It’s no surprise to him. I am encouraging myself today that he knows what I need, so I will remember that his reality comes first. So am I fully living life, or creeping along fearing the valley of the shadow of death? We live our lives journeying through these different landscapes. Sometimes we hear the cry of the bird of prey and we become too aware of the shadow overhead. An awareness of the proximity of death in life might give us the vigour to savour every moment, or we might start living half-lives; retreating, not daring; waiting for the danger to pass, the falcon’s shadow to leave our landscape, until we believe we can poke our heads out again without fear of being snatched. Most of the time we lives somewhere in the middle. Jesus said, ‘in this world you will have trouble.’ He made no bones about it: no-one gets a pass. Some seem to get more trouble than others, but no-one gets away without a challenge or a choice. This is brave me talking. The other me just spent 10 minutes playing solitaire instead of braving the blank page. What was I afraid of? Lately a couple of things have reminded me of that Victorian penchant for the memento mori, or a reminder of death. I’m definitely not festooning my home with gothic interior design, but I did find myself today perusing the Wikipedia list of people who had died so far this year, prompted by the notable pile-up of British celebrity obituaries in recent days. On the same day I received in the post the alumnae magazine from my secondary school. Former students volunteer autobiographical narratives, with entries grouped by age. The magazine starts with women of great age and experience and relatively small daily round, who are counting their blessings that health procedures went well, that despite trouble of one sort or another they have loving relationships or an aspect of life they treasure. As one turns the pages the stories are about those whose lives are starting to narrow, but mostly happy (or they don’t write in); surprise at the number of decades since graduating yet the feel no different; grandchildren and greats; charity work and retirement. Reading on, in remarkably short order the groups tick by and people record surprise at turning 50, on new careers, on fulfilling lifetime ambitions before it’s too late; and finally to my peers, our lives defined greatly by whether we have had children or not, a huge variety of choices of how we spend our time, but it’s mostly work or family, and a slow admission that we still haven’t worked it all out. But there are pages beyond mine: somehow there is a lengthening number of entries from younger women whose first career has been and gone, who are embarking on everything for the first time, or taking a break, marrying their long-time partner; and then there are the new graduates, fresh out of something; taking the world by storm, living life in the assumption that they couldn’t ever be one of those grey-haired ones whose page they flicked through at the beginning. When we summarise these things briefly for semi-strangers we only see the highs and lows; daily life is a lot slower, and we can easily get bogged down. When we are going through that valley of the shadow of death, we need friends to make sure we keep putting one foot in front of the other. When Jesus said, ‘in this world, you will have trouble,’ he added something else. ‘But take heart, because I have conquered the world.’ In this context, the ‘world’ is the world ‘system’ (if you like); everything that carries on oblivious to God’s loving, life-giving nature; life in all its challenges. Living eternal life, or what we might call living in the light, or being ‘people of The Way’ (as Luke puts it), means we are following Jesus and are not actually subject to death at all. That’s a thought to dwell on. But it’s easy to start living a life with one eye on the shadow overhead, the vulture just out of sight, the hawk after its prey. As we being January again, lets allow ourselves to feel Jesus’ encouragement, as if he links arms with us and gives us a winning smile. In the light of that, when am I going to be as kind to myself as I am to others? When am I going to be as brave as others assume I already am? Jesus has set me free to live life to the full. God’s on my side. He’s bigger than any box I’ve imagined for him. If God is for me, what opposition is worth spoiling my confidence as I live life? Describing himself as like a shepherd guarding his sheep, Jesus said, “the thief [the Devil] comes only to steal and kill and destroy; I have come that they may have life, and have it to the full”. (John 10:10). ‘They’ mean us, his sheep. As it says in Deuteronomy 30:19: ‘choose life’.